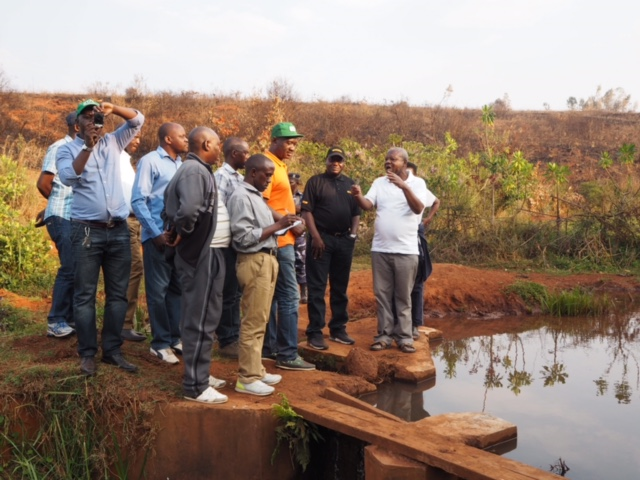 On 14 September, the Burundi Minister of Agriculture and Livestock, Dr Deo-Guide Rurema, visited IITA project sites in Muramvya and Gitega provinces. The Minister was accompanied by the first assistant and advisor at MINAGRIE, the DG of ISABU, the Director of CNTA, members of the Communication unit from the Ministry of Agriculture, extension officers, and media officers from national radio and television. The delegation visited a weather station at Bugarama Health Center in Muramvya Province under the framework of the CGIAR Research Program on Roots, Tubers and Bananas (RTB). The visit aimed to lead to: development of Pest Risk Analyses (PRA) and surveillance strategies to address the likelihood of introduction, spread, and evolution of RTB pests; development of a framework to predict impacts of climate change on pest spread and abundance and livelihoods of farmers; and building of capacity in CGIAR partners and national institutions to facilitate preemptive management of pests and support policy makers in the preparation of national and regional adaptation and quarantine plans. Over 27 weather stations are installed at altitude gradients between 800 and 2400 masl for close assessment and precision. The Minister urged IITA to work with national partners and services as part of a long-term strategy to address pests and diseases and address challenges associated with climate change. In Gitega, the delegation visited an association of pig farmers under the Crop-Livestock Integration Project (CLiP) project. The farmers in the area are engaged in a wealth sharing cooperative with a microfinance arrangement for credit and loan facilities. The Minister appreciated the crop–livestock integration approach as farmers benefit from improved crop varieties and livestock breeds while manure from pigs is used on their farms. The farmers had requested the scheme to be expanded to other provinces. The third stop was Makebuko to visit AGAKURA, a private partner promoting IITA technologies and practicing fish farming and drip irrigation for vegetable cultivation in association with banana. 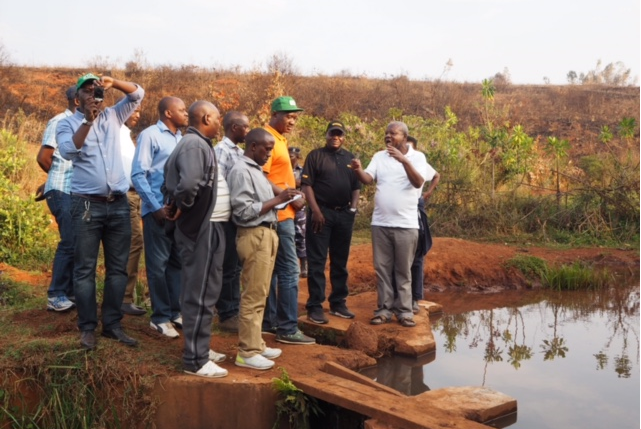 The Minister was impressed by the low running costs and equipment used for rehabilitation of marsh land, pisciculture, and drip irrigation, which are beneficial to farmers for off-season (during dry season) cultivation especially in the northern regions with low precipitation and rainfall. The AGAKURA juice processing factory was installed in 2013 and has never been operational due to lack of raw materials, electricity, and substandard infrastructure, among other challenges. The Minister promised to contact development partners and donors for support to overcome these challenges and get the factory operational. The visits ended with a press interview with the Minister urging that such initiatives be replicated and outscaled to other farmers.